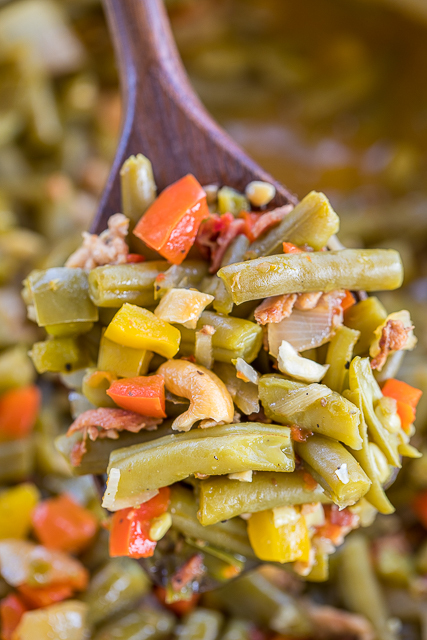 Amazing Italian Green Beans Recipe - green beans, bacon, onion, red, yellow and green bell peppers simmered in Italian marinade. Top with cashews. Got the recipe from a caterer. 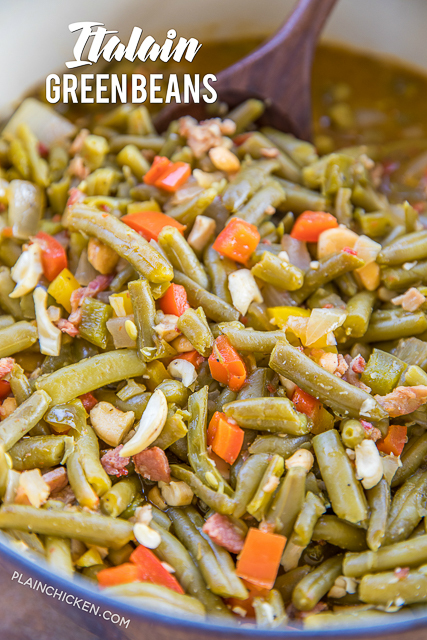 These are THE BEST green beans you will ever eat. This is a Chicken Legs original recipe. He had these green beans at catered lunch a few years ago and asked the caterer for the recipe. She would only tell him the ingredients, so we hit the kitchen and experimented with it until we got it just right. 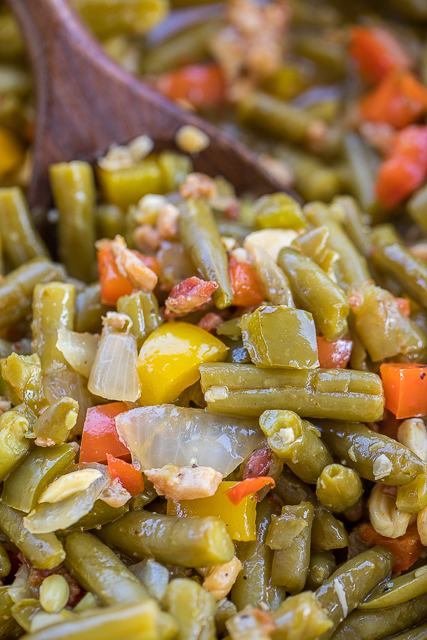 These are the best green beans we've ever had - seriously!! 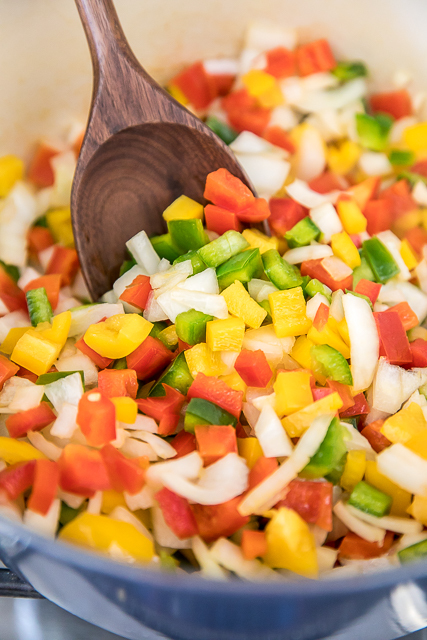 The recipe uses a trio of peppers, onion, bacon and Italian marinade - not dressing. 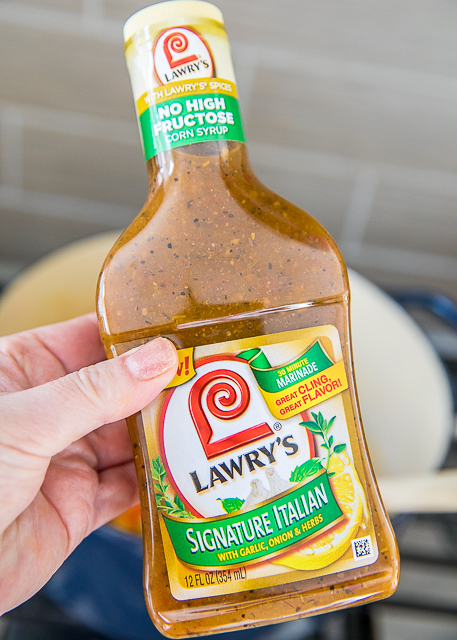 I used Lawry's Signature Italian marinade, but any brand will work. Just make sure you don't use Italian dressing. We served these green beans at Christmas with the skirt steak and sautéed mushrooms. You are going to want to steal this recipe! In medium pot, cook bacon until crispy. Add onions and peppers. Cook until onion is translucent and peppers are soft. Add green beans, marinade, water salt and pepper. Simmer for 30 minutes. Garnish with chopped cashews. Ooooh these look yummy! I can't wait to try! These look great! I love the added cashews...yum! So yummy looking ! Definitely want to try this! Oh yummm I'm going to have to try it!! Those look SO good!! I eat green beans about 5 times a week and could use a new recipe!! Gonna have to try this! I can't tell if you are using Italian green beans or not, but if you are not, you definitely should. They are right there in the canned green been aisle and so much more tasty!!! I am envious of your backsplash! I have to do ours this year. The beans look great. Nice way to juice up plain ol' green beans in a can. I was wondering if you can use fresh or frozen green beans? Lisa - fresh or frozen green beans would work fine. These look delicious and am planning to use this recipe when we have company in May.